MINUTES OF THE MEETING OF THE BOARD OF DIRECTORS OF SUNDARAM AUTOMOTIVE INDIA PRIVATE LIMITED HELD ON TUESDAY, 22ND MARCH, 2018 AT ITS REGISTERED OFFICE AT TATA CENTRE, 16, SOUTHERN AVENUE, KOLKATA – 700001 AT 6.00 P.M.
With the unanimous decision of the Board Members present, Mr. Sanjay Sinha took the Chair. The Minutes of the Meeting of the Board of Directors held on 23rd December, 2013, draft of which had been circulated to the Directors, were considered and reviewed and unanimously approved by the Board Members and signed by the Chairman of the Meeting. 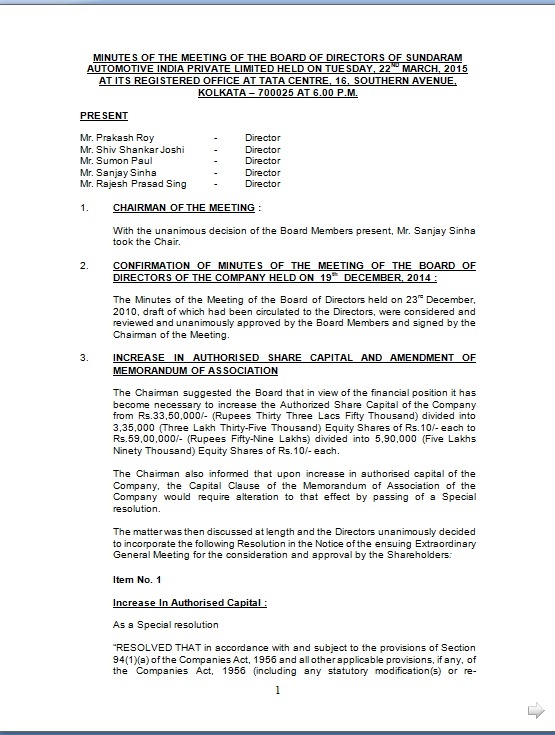 The Chairman suggested the Board that in view of the financial position it has become necessary to increase the Authorized Share Capital of the Company from Rs.33,50,000/- (Rupees Thirty Three Lacs Fifty Thousand) divided into 3,35,000 (Three Lakh Thirty-Five Thousand) Equity Shares of Rs.10/- each to Rs.59,00,000/- (Rupees Fifty-Nine Lakhs) divided into 5,90,000 (Five Lakhs Ninety Thousand) Equity Shares of Rs.10/- each. The Chairman also informed that upon increase in authorised capital of the Company, the Capital Clause of the Memorandum of Association of the Company would require alteration to that effect by passing of a Special resolution. The draft of the Notice convening the Extra Ordinary General Meeting (EGM) of the Company along with the Explanatory Statement was then placed on the table for consideration and approval. The Board discussed the financial position and general affairs of Company. There being no other business to be transacted the meeting terminated with a vote of thanks to the Chair.